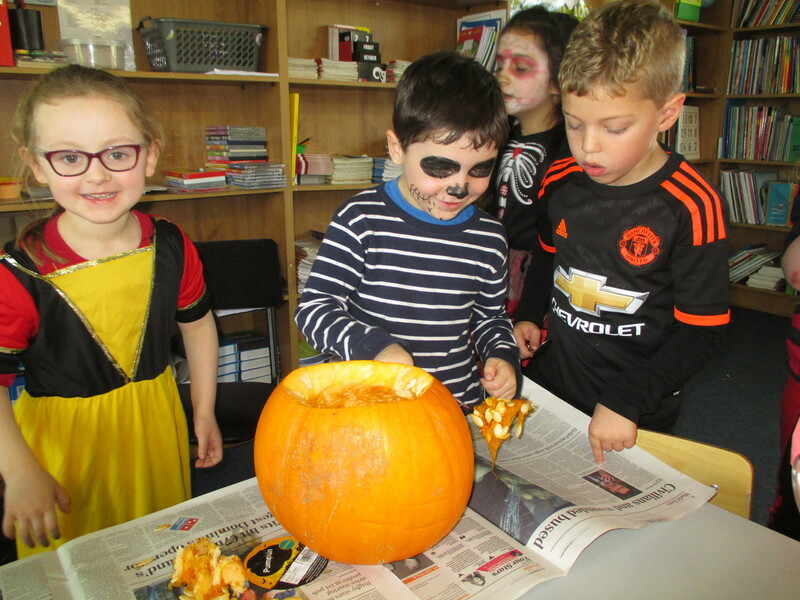 We have been learning about Halloween. Long ago Irish people believed that November 1st was the start of a new year. It was called Samhain. 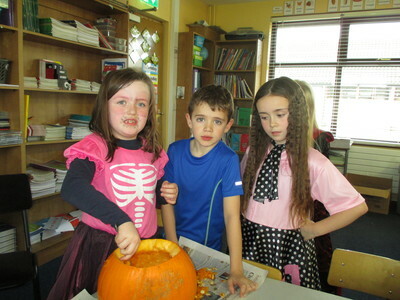 Oíche Shamhna is the Irish word for Halloween. People built bonfires the night before November 1st because it was the last night of summer and the end of the old year. They wore homemade masks to scare away ghosts before the winter came. Winter was very dark then as there was no electricity. Irish people used to carve out big turnips at Halloween. They put a candle inside the turnip to scare away ghosts. When Irish people moved to America, they brought this tradition with them. 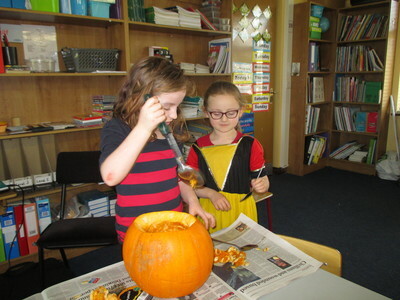 There are lots of pumkins in the autumn in America so the Irish people carved out the pumpkins instead of turnips. Now we do the same in Ireland. After learning about pumpkins we carved out a pumpkin of our own with the help of our teacher. 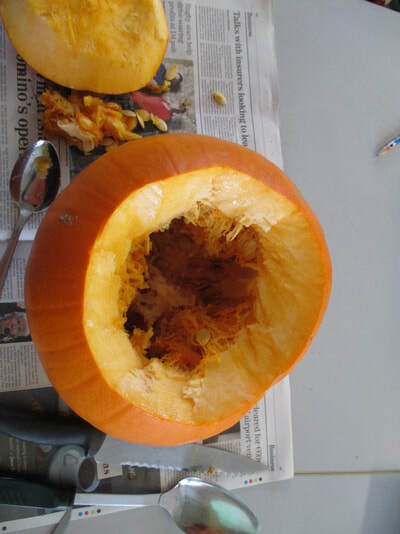 It looked very scary when we were finished!!! We also learned about a favourite food at Halloween called barmbrack or bairín breac. Sometimes there is a ring hidden inside. Years ago people would put 5 things inside their bairín breac: a ring, a pea, a small stick, a coin and a little rag. It was a fun way to tell the future. Finding a ring meant you will get married soon. Finding a pea meant you will not get married. Finding a small stick meant you will have a row or fight with someone. Finding a coin meant you will be rich or lucky. Finding a little rag meant you will be poor or unlucky. We then did some Halloween art in class. Take a look at our friendly witches. Title – What the recount piece is about. Orientation – When and where do the events take place and who was there. Sequence of events – What happened in the correct order. Personal comment – How the events made the writer feel. 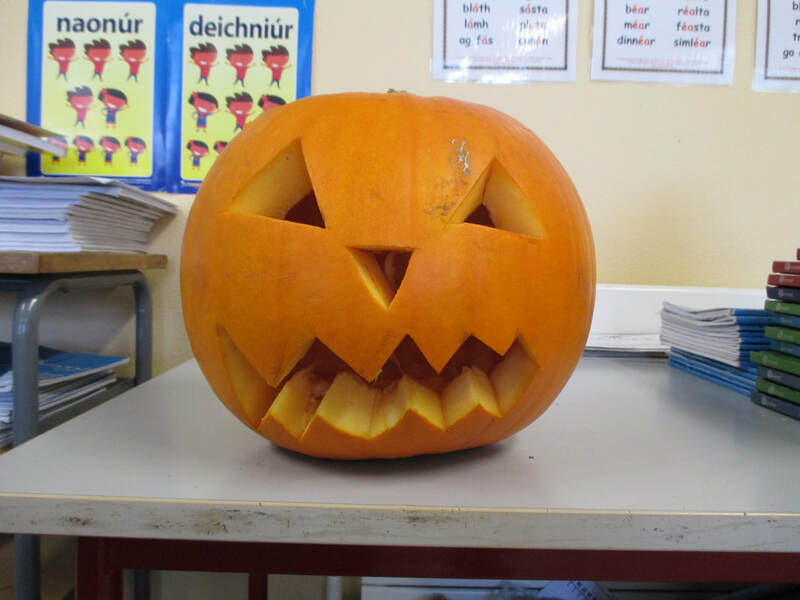 As a class we wrote a plan on the title ‘Gaeilge sa Halla’. After this, we used our plan to write a first draft. Finally, as a class, we edited our piece until we were happy with it. Have a read of our final draft below. On Friday 29th September, all the teachers and children in Scoil Mhuire, Magherarney went to the hall for Gaeilge sa Halla. First, we lined up in our classrooms and went out to the hall. Then, Junior and Senior Infants stood up and said some poems and sang some songs. They were very good. Next, 1st and 2nd class performed some Irish. We did days of the week, colours, feelings, counting people and lots more as Gaeilge. We also said a nice poem. 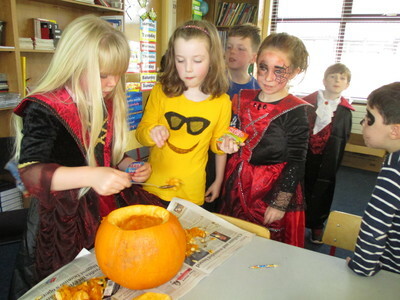 After that, it was 3rd and 4th class's turn. They asked and answered questions in pairs. They were very confident. Finally, 5th and 6th class did a play about a TV programme. It was so funny. 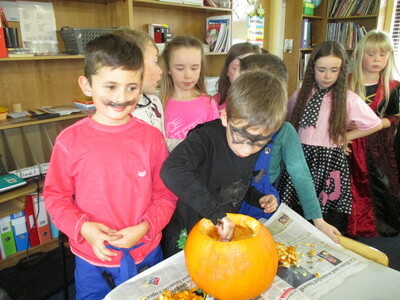 We really enjoyed Gaeilge sa Halla and are looking forward to learning more Irish next month. A lady called Emma from the RSA came in to our classroom recently to talk to us about road safety. Firstly, she asked us how we travel to school. Some children come by car, some by bus, others walk while some children cycle. We then discussed how to stay safe when walking, cycling, travelling by car and in a bus. Next, we looked at different pictures on the interactive whiteboard and discussed what was safe / unsafe in each picture. We were very surprised when Emma told us that we are 300 times easier to see when we have a hi-vis jacket on!!! 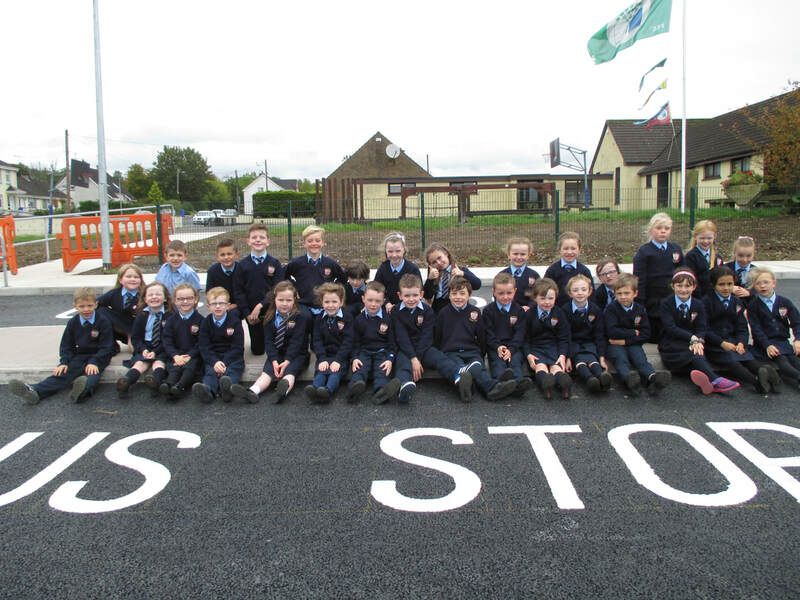 Finally, everyone in the school went out to the new car park to learn about staying safe when coming and going home from school. This is a photo of us in our lovely new carpark which we are really excited about using every day. 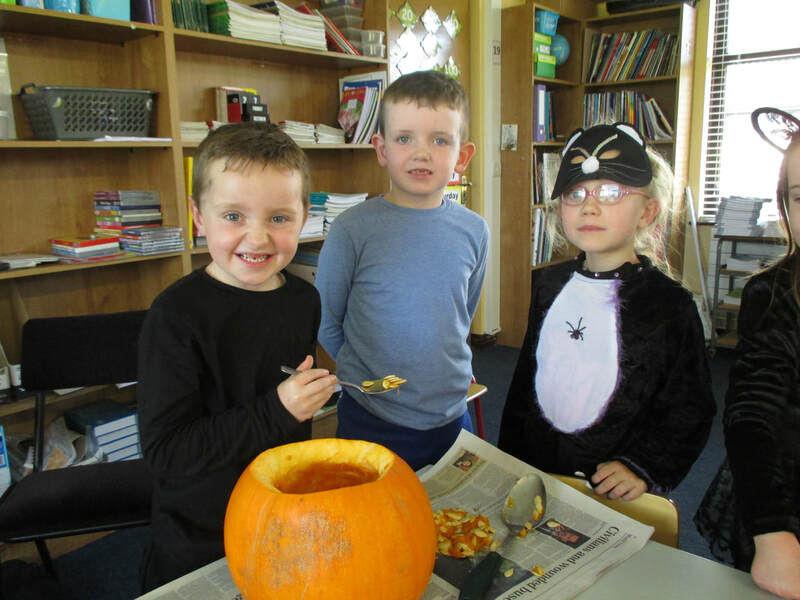 Poetry in 1st and 2nd Class. We learned a poem in Irish called ‘Is maith liom’. Have a listen to us saying our poem. We then talked about foods in Irish that we liked and disliked. We drew a picture of one food that we liked and one food that we didn’t like which had been mentioned in the poem. Stop using the scissors if you want to look up. Cut in a direction away from your body and fingers, hands, arms, and legs. Never run, climb, fight or horse around when holding scissors. We practised cutting out curved lines, zig-zag lines and cutting around corners. Here are some samples of our work.